The USS Enterprise, a hallmark of the Star Trek franchise, has been an iconic science-fiction vehicle for the last half-century. It’s only natural, then, that, in their darkest moments, some fans will fantasize about seeing the thing crash and burn, dooming all the passengers aboard. Redditor ejustice has taken this beautiful dark twisted fantasy and turned it into a delightful and delicious gingerbread creation, just in time for Christmas. The Starship Gingerprise, an instantly recognizable miniature version of the famous ship, is shown plummeting to the ground, engulfed in cottony smoke. Ejustice uses this Food Network recipe for dough: “It proved to be the best for building.” But what really makes the Gingerprise work is the expert decoration, with the candy and icing standing in nicely for the familiar features of the ship. Bonus points for the use of peppermints, which make excellent stand-ins for the Enterprise’s Bussard collectors. Here, for the sake of comparison, is what the crash looked like originally. 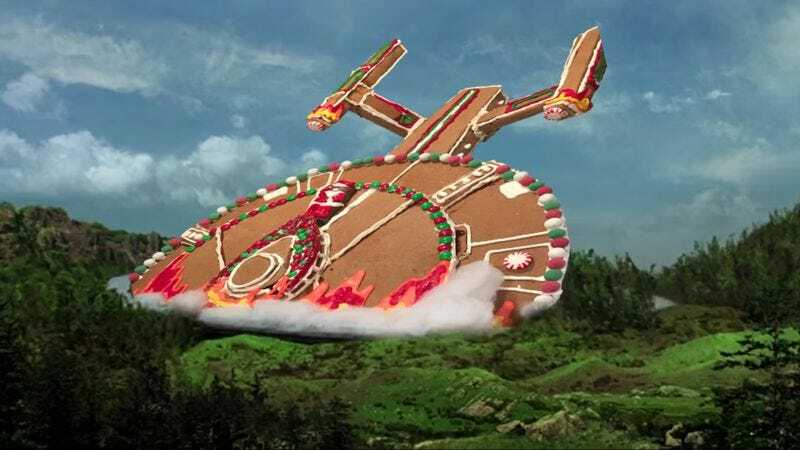 Whether this scene is made more or less silly by the addition of gingerbread is debatable.